The majority of repairs involve the heater leads or terminations that have been damaged either through plastic leakage or mechanical damage. 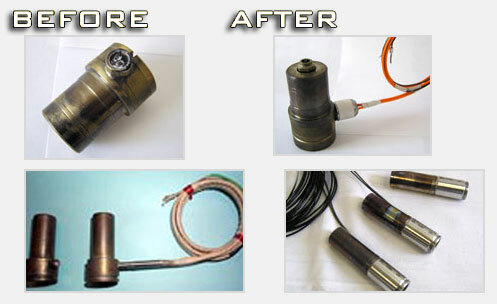 We restore your nozzle heaters to good as new. All at considerable savings over OEM pricing. One of the largest costs associated with maintaining hot runners is replacement of components such as nozzle assemblies, valve bushings, and spacers. In addition to the cost, production lead times can be excessive, especially for older systems. Hot Runner Technology now offers a component repair service that significantly reduces cost while enabling you to bring your hot runner back to original tolerances. A common problem with older systems is wear at the nozzle seal-off diameter, which allows plastic leakage down the nozzle and around the heaters. The Hot Runner Technology solution involves micro welding and grinding the seal-off diameter to original factory tolerance. The cost is a fraction of a new housing. Manifold component repairs available at both locations - Hillsborough, NJ and St. Charles, IL.